-The basket is centered directly over the stand base to improve the balance of heavier drums and to allow unobstructed positioning of the feet between the pedals. 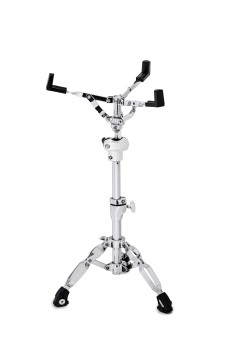 -The adjustable base height allows the entire center tube and basket to drop down fully, providing room for the added height of deeper snares. -The high-friction rubber feet with retractable spikes for rugs or mats stop the stand from shifting around during aggressive play.